More animal prints on the way. Following a striking “Zebra” colorway, Nike‘s Air VaporMax 2.0 now debuts a tiger stripe edition from its larger animal-themed pack scheduled to release later this Fall. This Air VaporMax silhouette features a black and orange Primeknit upper with a tiger stripe patterned heel clip. 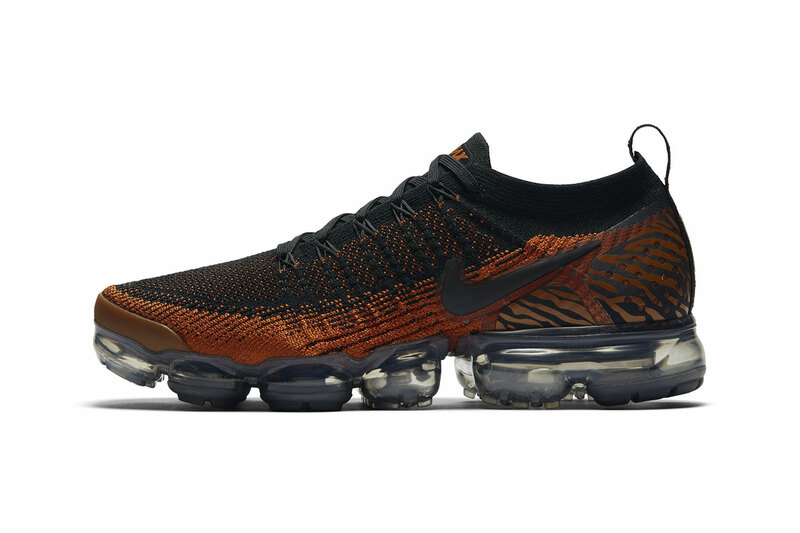 The wild colorway is complete with a black Swoosh, orange Nike branding at the tongue, accented heel pull tabs, a translucent black Air VaporMax bubble sole unit and special edition insoles. The Air VaporMax 2.0 “Tiger” will release sometime this Fall for $190 USD at Nike’s web store. Stay tuned for more details and in the meantime, check out the Nike LeBron 16 “King Court Purple” for more animal print sneakers. Nike's Air More Money Gets Dipped in "Metallic Gold"